The underfloor heating is going down. The client has chosen an engineered oak floor, this means the carbon film type of underfloor heating is most suitable. This is laid on 6mm of underlay/insulation then the timber floor on top. This means the heating element is placed directly under the timber floor, but on top of the insulation. 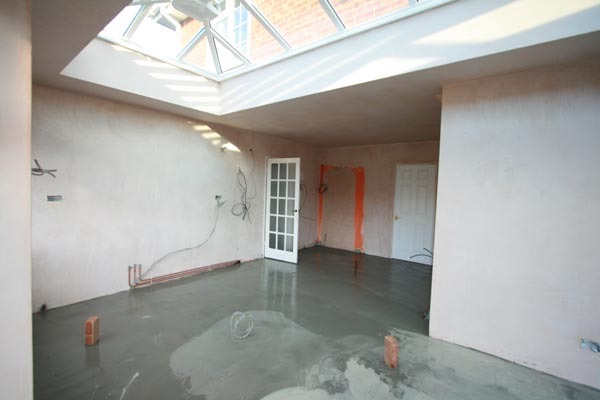 The electric underfloor heating is laid and covered with a latex floor levelling compound. Despite our protestations, the kitchen company and the client decided the floor is to be tiled before the the new kitchen is fitted. This is both unusual and unnecessary, and greatly prolongs the period of time the client will be without a working kitchen. As you can see from the photo, the old kitchen has been completely removed to allow the underfloor heating to be laid. It would have been far better to leave the old kitchen in place for as long as possible, then install the new units and get the sink etc working, then lay the underfloor heating between the kitchen units and finally tile on top.